BBC Blogs - Technology & Creativity Blog - Now, Next, Future: will we be doing things differently? The BBC’s Technology Strategy & Architecture Community is a mixture of strategic, technical and product thinkers, who inform and lead the wider BBC Design + Engineering division, and the BBC as a whole, on technology direction. 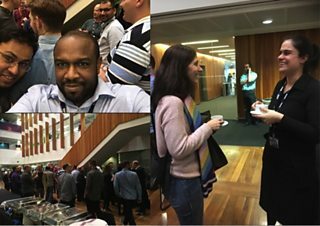 On 7th February 2019, the BBC’s Technology Strategy & Architecture (TS&A) Community gathered in London to listen, discuss and propose solutions to the challenges we face as an organisation and how we, in BBC Design + Engineering (D+E) help to position the BBC for the future. Before the event, we asked a few people about their expectations. New starts to the organisation simply said, “I see this as a good chance to put names to faces and get to know people”. Others, who have been part of TS&A and the BBC for a longer period of time expected to hear more about the current strategy (“the now”) and what are the plans over the next 2 years (“the next”). Some attendees did honestly state that they had low expectations but turned up for the social, as it is good to stay in touch with the wider architecture community. The range of opinions, expectations and skills within the TS&A Community is exciting. It is this diversity of experience and perspective that fuels the way we engage and influence the rest of the organisation. The Community event was kicked off with a tour of our broadcast playout media services provider, RedBee Media, including a look at the broadcast studios and post-production suites. The proceedings of the main event then featured demonstrations from the BBC’s Blue Room and Research & Development teams, an invited speaker to talk about Architecture Innovation, a panel session with the BBC’s Senior Leadership Team and an ideation session based on innovation frameworks and audience needs. In this article we report on the highlights of the event and use this as an opportunity to challenge if indeed we are doing things differently, given the changing cultural, political and socio-economic environment within which we operate. Mike also referenced Henderson and Clark’s seminal paper on Architectural Innovation, defined as the reconfiguration of links between existing product technologies to deliver new value, as opposed to radical or incremental transformation. In his opinion, and supported by Henderson and Clark, the challenges for established firms to innovate in response to change are due to the inherent complexity of their organisational and technological architectures that emerge over time. In comparison, small start-ups have little or no inherent complexity, enabling them to innovate at a rapid, truly responsive pace. Mike proceeded to give examples of radical, large-scale innovation, such as GOV.UK and the DVLA, where their transformation timelines were planned for 400 days, versus the Peruvian government’s digital platform (http://gob.pe) delivered in just 6 weeks. Incremental innovation reinforces the capabilities of an organisation, while radical innovation causes them to ask different questions. Radical innovation is about opening up new markets and audiences, while iterative innovation often seeks to maintain prominence in existing markets. This understanding of innovation approaches dismisses the notion that digital transformation requires or equals radical technological change and inventive marketing. Effective transformation is about cultural change and service delivery, where small teams are empowered to work in radically different ways. It is allowing these small teams to deliver smaller, incremental business value more frequently as opposed to big, one-off disruptions. Transformation relies on teamwork and not just leadership. Its success requires teams that are allowed to work in agile ways with people at the heart. 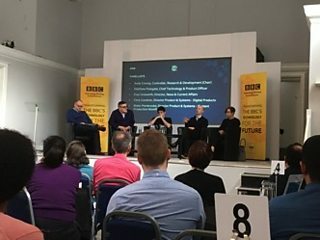 The second part of the day took us to a panel discussion chaired by Andy Conroy, Controller, BBC Research & Development on the topic of making the BBC more agile. The key questions here were ‘what do we mean by agile?’ and then ‘what does that mean for the BBC?’. It speaks to the difficultly of creating change that, nearly 20 years after the publication of the Agile Manifesto, and the publication of countless books on the subject, we are still asking these questions. Helpfully, Chris Condron gave us three working definitions… ‘the ability to move quickly’, ‘empowered autonomous teams’ and ‘working with testable hypotheses’. This fitted well with the presentation from Mike Bracken in the previous session but led to more debate. How do we define autonomous? What is moving quickly? What is the right speed for the BBC? Addressing this point, Matthew Postgate, Chief Technology & Product Officer, asked if US west coast hubris is the right yardstick to judge the BBC? In the light of Cambridge Analytica and the criticism of the attention economy, does the commonly accepted Silicon Valley mantra of ‘move fast and break things’ make sense? Especially if what you break is society. Fran Unsworth discussed the role of journalism in a digital BBC and addressed the need for further education and empowerment of journalists to ‘think digital’. It was clear that cross functional working and giving space to autonomous teams to make brave decisions is a key part of making the BBC more agile. Robin Pembrooke discussed the need to streamline and make more efficient the purchasing process for new platforms and systems. Embracing the agile philosophy throughout the RFI/RFP process, through contract and supply is a key area of digital enablement for organisations that is often forgotten about during transformation. The discussion circled in on why being agile and having a strong digital presence are important for the BBC. What is the size of the prize? Matthew Postgate answered to spontaneous applause. In essence, his answer was… In a software defined world polarised by hyper capitalist America vs hyper statist China, we need to find an alternative path. The prize is to give the world an alternative; an inclusive, impartial, public service oriented digital media organisation. In our opinion, if we are agile enough to achieve this, then no matter what speed we go at, we are doing the right thing. After participating in an insightful panel discussion focused on agility, it was time to think about the frameworks we could use to effect change. 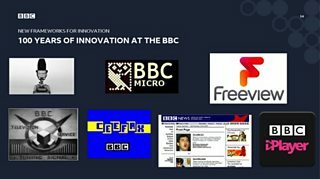 Jon Page, Head of the BBC Architecture Transformation Group, reminded us that innovation is not a new experience for the BBC. We have a legacy of over 100 years of innovation in television, radio, broadcast and online. The BBC has been at the forefront of delivering value to the public in various forms of products and experiences, as well as in the creation of partnerships. Sustaining Innovation: larger advances that provide users with distinctive new experiences likely using existing products and services. Discontinuous Innovation: a very different product, service or way of working than previously been available (e.g. the introduction of iPlayer). To continue our legacy of innovation, we need to create a blend of the above and not believe that one is more “innovative” than the other. Furthermore, profitable and relevant innovation brings together multiple disciplines to contemplate alignment with business strategy, unmet user/audience needs and emerging technology opportunities in a changing market of capabilities. After lunch, the focus shifted to looking at future experiences and unmet user needs of BBC audiences. This started with presentations from the BBC’s Blue Room which showcased current and emerging platforms that are heavily used by 16-34 year olds, such as TikTok, Twitch and Playsight. This is a key demographic for the BBC as it’s under-represented in audience engagement. A key part of the BBC’s charter is universality and it’s recognised that the BBC needs to do more to provide content and experiences that engage this group. 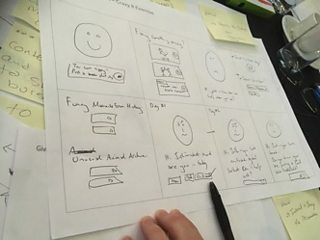 Following this, Tammy Gur, Head of UX for Immersive Experiences led groups through a design exercise. Broadly, the challenge was to engage 16-34 year olds using emerging technologies. The session used the now well established Design Sprint framework developed by Jake Knapp at Google. Albeit, as is so often the case, the five day sprint was compressed into less than five hours! The Design Sprint framework puts structure and process around the ideas central to design thinking and particularly encourages divergent and convergent thinking in a group scenario. It’s a powerful tool and is commonly used both at the BBC, across the technology industry, and beyond. The session started by looking at unmet audience needs through the eyes of some key personas created, based on research from BBC Marketing & Audiences (M&A) - the BBC’s in-house market research group. We then got stuck into the routine of brainstorming, crazy 8s, dot voting and presenting ideas until each group had an outcome they were happy with. The final ideas were judged by Jatin Aythora (BBC Chief Architect) and Andy Conroy (Controller BBC R&D). The winning team - an idea for a sports fan engagement platform focused on the BBC’s coverage of live events - were all awarded a prize. This final session was met with mixed enthusiasm. 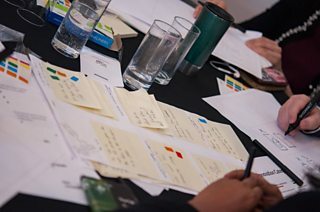 To many, it was a great way to explore the Design Sprint framework, something they were unfamiliar with, and to engage with colleagues across the BBC they didn’t normally work with. To others, it felt too far from their core role and perhaps they would have preferred a more targeted session dealing with some of the challenges they face in their day to day. Many would agree that this was an engaging session and it was great to meet new people. However, as with more technical hackathons, unless the output of an innovation session is used in a productive way, it can often feel like the energy in the room has been somehow wasted. How truly engaging would it be if there was more concerted buy-in to the problem and the solution was taken on to be developed for real? Following the event, we had a chance to chat with a few attendees about their experience and thoughts. Most were challenged by the perspectives on innovation and felt inspired to re-think some of the limitations we accept when faced with shaping the future. It was the ideation session in the afternoon that divided the camp. While some felt it provided them with fresh insight regarding audience needs and ways of deriving solutions, others found it difficult to significantly engage and benefit. This is a reminder that innovation is meant to be a continuous process and not a point in time. Innovation allows diverse skills, passions and mindsets to lead, contribute and follow at different stages, based on expectations and the nature of work. So, are we doing things differently? The answer to that question is “we must and we shall.” The reminders that innovation comes in different forms and frames removes “risk analysis paralysis” that often keeps organisations from exploring new ideas, technologies and opportunities. Innovation does not always have to be a radical upheaval and unplugging of wires; it can be more subtle, incremental steps that continuously and regularly deliver value. Although the term “agile software development” has been around for almost two decades now, there is still much discussion about adopting these practices. This suggests that an agile way of working is based on relativism and not an immutable set of principles. Agile is about adjusting behaviours, styles and processes that fit how people live, work and communicate. Having empathy and people-centrism at the core of technology and product development gives greater likelihood of understanding and meeting user needs now, in the next few years and in the future.